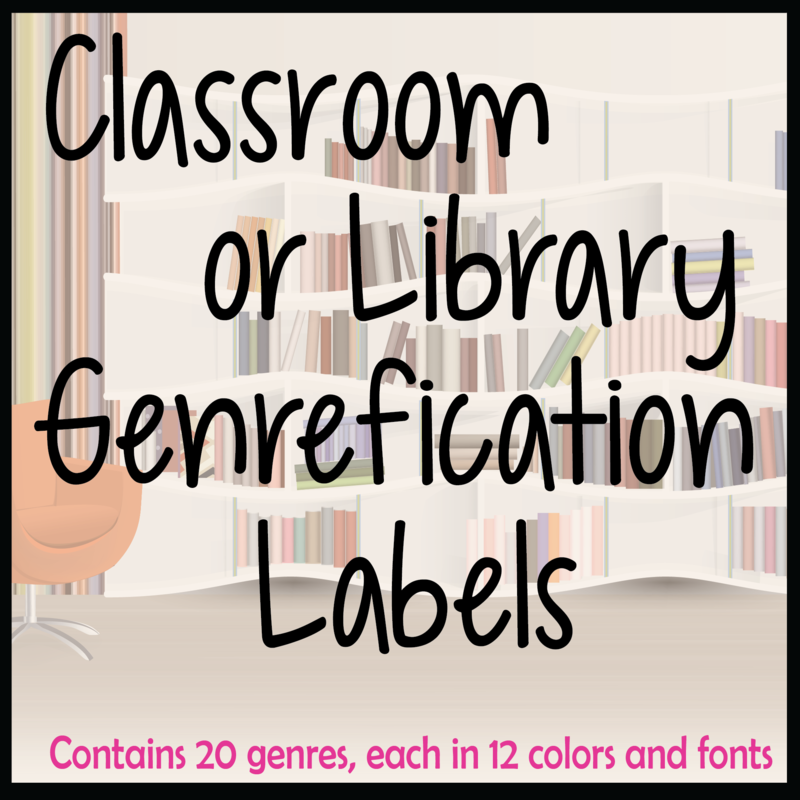 My genre shelf labels are now available from my TPT store. This is a growing bundle as I continue to update and add new labels periodically. Once you download the labels, you will receive all future additions free. 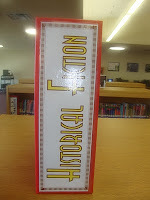 I got this idea from another librarian in my district, and these signs are now on all my library shelves. She told me she found it in a book about library display ideas, but I do not know the title of that book. Where ever it came from originally, I cannot take credit for its simple brilliance; I am merely passing it along here. All my files are red because our school colors are red and white. 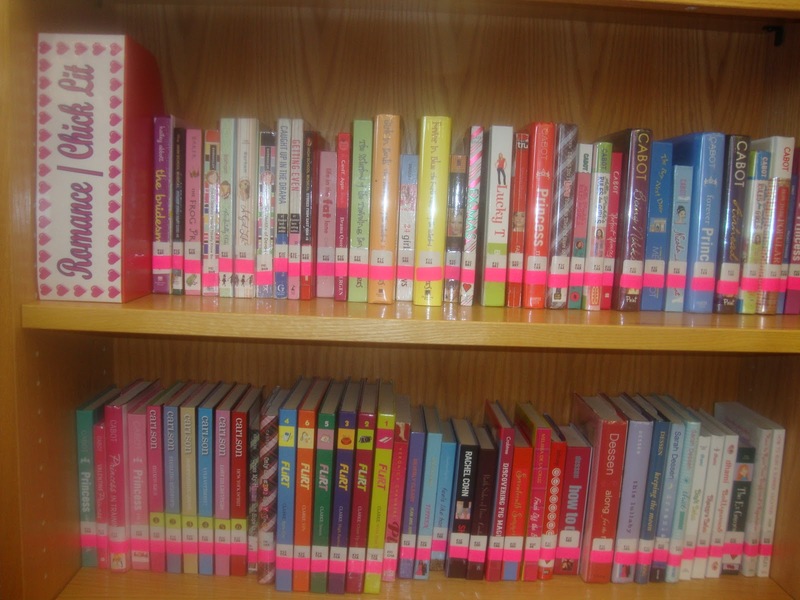 Another possibility is to order all fiction books in one color and nonfiction in a different color. Or, you could use four colors for reference, fiction, nonfiction, and biography. Whatever system you use, make it work for your library! MAKE A LIST OF THE SIGNS YOU WANT TO CREATE. Walk around your library to see what sections need to be broken up with signs. What sections never get checkout but would if patrons knew what was there? How do your patrons ask for books? For example, if they call domesticated animals "PETS," then that is the wording you should use on the shelf sign. 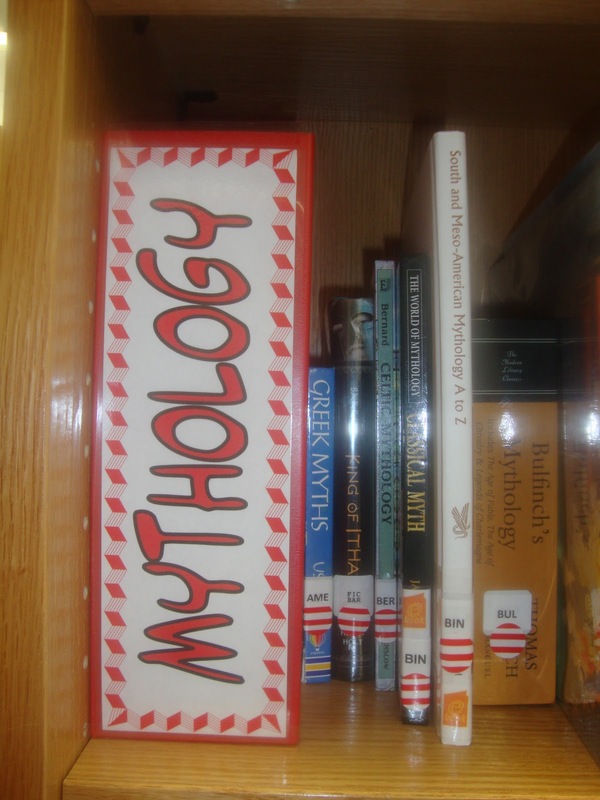 How can these signs help your students find books more easily, so they don't always have to ask you? What types of signs will attract their attention or help unsure browsers make a decision before their class leaves? I created my signs in PowerPoint, but Publisher or Pages would also work well. Use clip art, color, whatever you can think of to make them pop. The whole idea is to make signs that attract attention, so get creative! If you don't have time, energy, inclination, or whatever to create your signs, mine are available on TPT. Please note that the shelf labels I have on TPT are not the same labels pictured in the photos above. To avoid a potential conflict of interest, all my TPT products are created specifically for TPT and not for my school. I cut them before laminating to lessen the chance of peeling. TAPE THE TOP AND BOTTOM OF EACH SIGN TO THE LONG-SIDE OF THE MAGAZINE FILE. 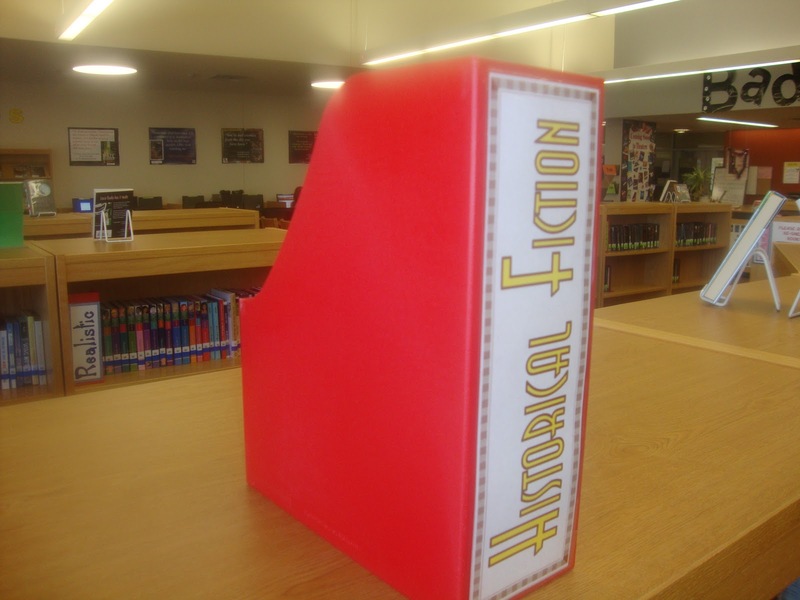 The file will face long-side out on your shelf to mark the books on that shelf. I tape the top and bottom (rather than rolling pieces on the back) because the corners of the sign will curl over time and need to be replaced. I have had the best results using book tape to secure the entire top and entire bottom to the magazine file. PLACE THE SIGN ON THE SHELF. I experimented with putting the sign in the middle of the shelf, between books, but I found that they did not stay in the right spot and tended to slide around. 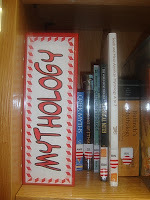 For me, placing the sign at the beginning of each new row of books works best. I also try to place one sign on each row of shelves to denote what is there, even if that row's sign is the same as the one above. 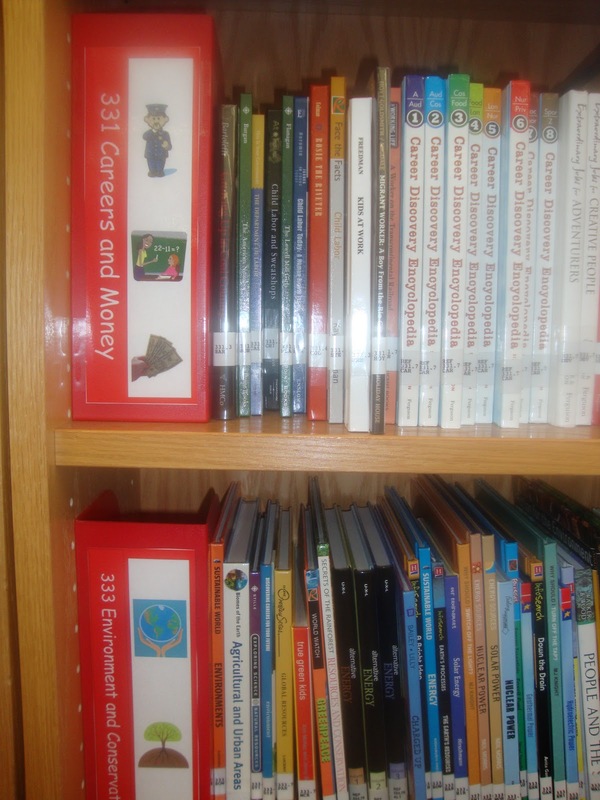 It makes it easier to see that both rows contain books about "Outer Space" or whatever is there. The shelf signs will take some time to create, so start small. Maybe only put signs in one section to start with, or choose ten sections that you want to better promote. Or, select sections that patrons constantly ask you to locate for them. I promise, the time spent creating the signs is well worth it and will save you time in the long-run since you can more easily point out popular sections to your students. Thank you, Jo! And welcome to the awesome world of librarianship--it's the BEST! 5 for 1.49 from Ikea!!!! Shelf Signage is so much useful. There are a lot of people who love to read books. They have a lot of books that's why sometimes they can not find their book. If they use this Signage they could easily find their books at a short time.